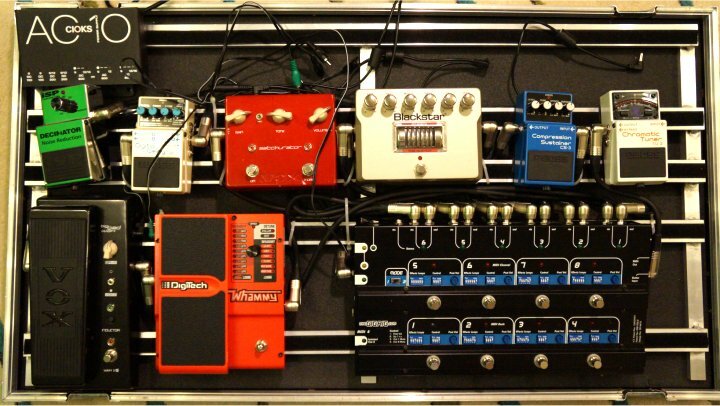 Building a guitar pedal board is always a huge custom work in special if the board has to be used for both live and recording scenarios. If additionally some “specials” needs to be implemented then be sure to have enough coffee in your office, it will be hard work. I decided recently to change my pedal board and build something new from scratch… The task list was pretty short at beginning: no sound compromises, live and recording usage; simple… One of the first decisions was to keep the signal path as short as possible and always remove from the signal chain all pedals which are not used for the current selected sound/patch. 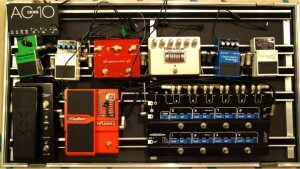 This should be usually simple enough; the usage of a programmable looper should solve that problem with zero additional efforts and provide the requested flexibility for creating new setups whiteout the need to re wire the pedals. First, given the collection of pedals and their sizes, I decided to go for a full custom construction, custom case, a custom built pedal train using aluminum profiles, and custom built cables matching the pedal placements on the pedal train. After 75% of the gear was preliminary put in place as you may see in the picture (some words in advance: big chaos on the board in this phase of the project, all flying around), all connected and quickly programmed, I started to test the functions one by one. Amplifier on, clean channel selected, basic tone dial in and… Wuuuuummms, just shredding a couple of licks and riffs. Works! Great I’m thinking, let’s mount overnight all parts finally on the board and test next day more intense with a pretty final setup. This was my initial thinking… You may ask yourself, why I’m explaining this all to you, it’s just crystal clear and simple, everybody did the same. Well, I guess you possibly wrong. Read the next part. One day later. Pedal board mounted, devices fixed, cables fixed additionally on the back side of the pedal train… I plug the mains, select the big f*in Marshall 401H head, change in a rush the programming for two setups to use only the Big Bad Wah and the ISP noise gate, flip the Marshall on channel three with a full load of gain and start wondering myself whiteout having played a single note! What the hell went wrong? Hum, hum and again hum noise! Wtf about this hum? 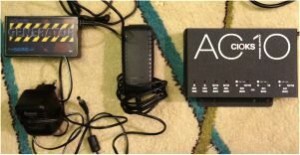 All connected right, power delivery using isolated high quality power adapters, quality cables, no ground loops, should all work as expected. Yesterday it worked fine! New ground loops? Nope. But is not working, just humming… Ahhh, yesterday we used only the clean channel of the head amplifier, right? One day later. All devices disconnected again big chaos on the board and I start the try & error bug finding procedure. Which device introduces that hum? Which combination of devices introduces hum? To be clear about the topic: using a clean channel or just crunchy channel setup on the head amplifier works fine enough for a live setup. I would suggest you to not trust any vendor and make self the following test which I also did. Take one single pedal and your power adapter you trust (and was already tested in your studio or at home). Plug no guitar in, plug only the cable connecting the the pedal output with the input of your amp, select on the amp a high gain setting, connect the power device, switch all on and listen, listen and listen again. Compare the noise with and whiteout the connected pedal. If the connected pedal don’t introduces additional noise/hum you know to have a right working power adapter. No matter if the device is built using a switching circuit or is built completely analog, the filtering on the DC part is the key. Both hum + harmonics and in case of switching units the HF signal introduced by the switching part itself must be filtered out. No filtering or poor filtering and you will hear it! Now walk in the next music equipment store and buy your devices only after you have tested these with this method. I ran in to my biggest store in town and the folks advised me that all kind of fully specialized power units, from no name vendors to much known ones delivers the perfect power for the professional musician. I asked them to grab all 20+ different models available in store, vent with a sales guy in the demo room and connected one by one the power units as described above. That guy and some other folks from that store, who tried previously to convince me about their high quality products, stand pretty speechless in front of me: from 20+ devices only 2 (two) made the job, the rest was and still garbage… What I want to say: don’t trust and try yourself first! The second problem with my board was related to the current draw of the GigRig looper. I draw the GigRig power unit in the recycle bin, but only a hand full devices on the market are able to deliver so much current at 9V DC as requested by the technical specifications of the GigRig. By technical specification, it draws too much in order to be used with the one or two power devices remained in my list after the devastating power supply test. Given that fact, I measured directly the real power draw and to my positive surprise, by careful programming (not too much loops switched at the same time on, etc.) I could survive with ca 500mA current draw, using a dedicated power supply for the looper. So far I took the Ciocks AC10 which is able to deliver 600mA at 9V DC additionally to all the other isolated power outputs and this problem was successfully closed. Next day, all was preliminary rewired again and ready to go but hum noise was still hitting me from cabinets. The next problem was pretty fast discovered, no surprise would everybody think again, should be a power supply! Yup, all right, the power supply from the Blackstar HT DistX, a high gain valve distortion pedal, was the bad guy this time… The problem with this really nice and very versatile device is again the current draw: this one needs 1.1A at 22V DC! The Ciocks & co. can’t deliver! So far the only fast solution was to use the own Blackstar power supply, but as previously sad, just by having the power connected, pedal still off, loop managing this pedal still off too, introduces to much hum in the signal chain given my setup and usage scenario. The final solution was to remove this pedal form the pedal train… It still a great pedal, but will be not used for this pedal board. I’m playing now this board in studio and live and I can tell you that I don’t regret any minute spent in the research, testing, design and building. Please comment or post questions in this blog!